Are you trying to secure cloud applications, while reducing user friction? With the right technology, IT/Security professionals can empower employees to work securely and efficiently anywhere, anytime. Microsoft® Office 365™ continues to lengthen its lead as the world’s top enterprise cloud service. Nearly one-in-four employees in Fortune 500 companies are active on Office 365 — and more than 90% of those large enterprises currently have more than 100 active users. Because of this rapid adoption of cloud applications, organizations are looking for solutions that remove friction by providing secure, one-touch access for all of their enterprise applications. And as your digital business continues to evolve — with an increasing number of endpoints that live and work outside your traditional security perimeter — you will need a high assurance solution that is invisible to your users. 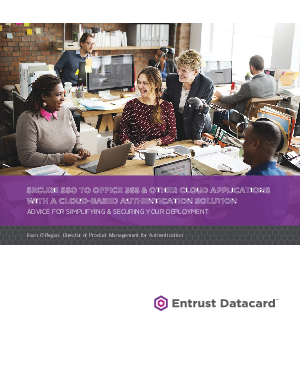 Learn how to achieve success when you download, Secure SSO to Office 365 and Other Cloud Applications with a Cloud-Based Authentication Solution.